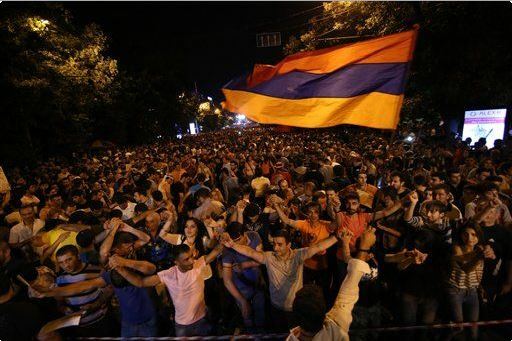 In reality, the protests are led by the same verified US-proxies exposed at the height of the “Electric Yerevan” protests mid-2015 which sought to undermine and overthrow the current government of Armenia in favor of a pro-Western political front more to Wall Street, London, and Brussels’ liking. At a recent thousand-strong demonstration in the capital of Armenia, Davit Sanasaryan took out a couple of eggs and threw them at the Russian Embassy. The gesture provoked both ridicule and approval in this small landlocked country that traditionally values very close ties with its large northern neighbor. “Our protests are not against Russia but against Russian policy and Putinism,” activist and politician Sanasaryan said in an interview with International Business Times last week. NCI associate Davit Sanasarian welcomed the audience with opening remarks. “The exploitation of the Teghut mine is an actual matter and it calls for serious discussions and proper suggestions prior to the undertaking of this project,” he said. The National Citizens’ Initiative (NCI) representatives attended, between 14 and 15 April 2011, the conference entitled “Assisting Armenia’s Civil Society Organizations.” This event was an initiative of the European Partnership for Democracy (EPD) organization and the Organization for Security and Cooperation in Europe (OSCE) Yerevan Office, and it was organized with the assistance of the National Endowment for Democracy (NED). The objective of the conference was to contribute in developing the capacity of Armenia’s civil society organizations by way of cooperation and exchange of know-how with Central and Eastern European civil society associations. Of course, considering that the US NED is chaired by pro-war corporate-financier representatives, “developing the capacity of civil society organizations” in Armenia was not actually on the agenda. Instead, creating a proxy front with which to control Armenia on behalf of foreign interests was, merely couched behind “civil society.” Sanasarian’s “association” with the NCI in this context, is troubling to say the least. In partnership with the US National Endowment for Democracy (NED), the third 11-day evening DemSchool was launched at the Armenian Institute of International and Security Affairs with “Challenges to Democracy” heading. Certificate award ceremony was held on the DemSchool 11th day. David Sanasaryan, member of AIISA Board of Trustees, young politician and activist, also participated in it. At a Yerevan rally attended by several hundred activists on July 17, Rise Armenia leader and opposition Heritage party city councilor Davit Sanasarian said a new campaign against the electricity price hikes would take place from July 27 to July 31, with demonstrators blocking the central streets of Yerevan and other cities around the country. RFE/RL would inadvertently admit that the protesters were simply using electricity prices as a pretext to come out into the streets and that their next move would be of a more political nature, targeting Armenia’s sitting government. In other words, it was a US-funded color revolution couched behind legitimate concerns regarding utility prices. Considering these extensive ties to US-backing, Sanasarian’s role leading the current anti-Russian protests portrays him not as a ‘politician’ or an ‘activist,’ but as a foreign-funded proxy, and the protests themselves as foreign-engineered meddling, not legitimate dissent. Claims that he is fighting against Russian influence, while all along he is serving as a conduit for Wall Street, London, and Brusssels’ influence touches upon the sort of hypocrisy seen again and again amid engineered protests targeting the many enemies of Western hegemony worldwide. This article originally appeared on New Eastern Outlook.